The establishment of cell and tissue culture techniques as well as nucleotide sequencing methods allowed for taxonomic classification of rhinoviruses. An overall RNA sequence compilation revealed a close genetic similarity to polio- and coxsackiviruses; hence, rhinoviruses were identified as members of the family Picornaviridae. The genomic organization is similar in all genera of Picornaviridae (Figure 1). 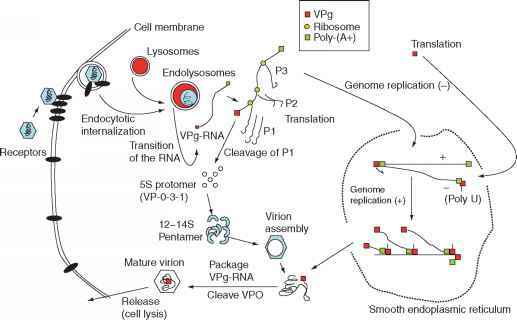 The 5' end of the RNA is joined to a small viral protein called VPg, which is a prerequisite for the synthesis of the negative RNA strand as a template for replication. The genomes of aphtho-, erbo-, kobu-, tescho-, cardioviruses (e.g., the foot and mouth disease virus) contain an additional gene (leader) at the 5' end of the RNA. The 5' end also contains the internal ribosomal entry site (IRES) sequence and allows binding to the ribosomal subunits of the host translational machinery. Following the IRES sequence is a single long open reading frame (ORF) encoding the structural (or capsid forming) proteins designated as the P1 precursor and nonstructural proteins (proteases and RNA-dependent RNA polymer-ase) designated as the P2/P3 precursors(s) (see Figure 1). The RNA genome is completed by the 3' nontranslated region and a poly-A tail. The protease 2Apro coded by the P2 precursor was found to have multiple functions. It is required for the inital proteolytic separation of the P1 and P2/P3 precursors in the nascent rhinoviral polyprotein, but also inactivates the cellular eLF-4F complex, thereby inhibiting the translation of the cellular mRNA and initiating the virus host shutoff (VHS — the translational machinery of the host cell is producing viral proteins only). Further steps of the post-translational maturation are catalyzed by the protease 3Cpro/3CDpro (see below). Products of the latter proteo-lytic activity are the VPg protein and the RNA polymer-ase. The capsid is composed of four proteins (viral proteins, VP1—VP4, see Figure 1), which arise from a single polyprotein generated from the viral RNA genome functioning as an mRNA. The very first cleavage occurs while translation is still in process. This first proteolytic maturation in cis is carried out by the protease 2Apro, which separates structural proteins from those necessary for the replication (designated as P1 and P2/P3, see Figure 1). A series of further cleavages form VP1, VP3, and VP0; the latter is finally processed to result in VP2 and VP4. Many picornaviruses undergo VP0 cleavage during virion maturation. Apparently, intact VP0 is necessary for correct assembly of the protomers, whereas processing of VP0 is necessary for the final maturation of the virion. Both viral proteases are targets for an inhibitor screen (see below). Figure 1 Schematic map of the rhinoviral genome and the encoded proteins. The rhinoviral genome consists of the 5' IRES sequence (thin black line), followed by one open reading frame (bold black line) and the polyadenylation site. At the 5' end the VPg protein is linked covalently to the RNA. Below, the regions representing the rhinoviral polyprotein are given. Compounds forming the capsid (structural proteins P1, blue boxes) and nonstructural proteins (P2-P3) such as proteases and the polymerase (light-blue dotted boxes and red dotted boxes, respectively) are translated into one polyprotein. The polyprotein becomes (auto-) proteolytically cleaved until the mature proteins are ready to form new viral particles. The following steps of rhinoviral reproduction probably do not differ from other members of the Picornaviridae. The RNA genome can be instantly translated; however, for replication of the genome a complementary (—) strand must be synthesized first. Essential for this step is a priming reaction, which is started by the VPg precursor 3AB. The hydrophobic portion of this protein is anchored in endomembranes and is linked to a poly-U tail. After formation of an RNA:RNA duplex at the 3' end of the (+) strand, the polymerase synthesizes new (—) RNA strands. Only 5—10% of all rhinoviral RNAs are (—) strands. The synthesis of a complete genome takes 45 s to a minute, underlining that the reproduction cyle of picor-naviruses in general and of rhinoviruses in particular is a fast process. Synthesis of rhinoviral RNA in nasal washings could be detected 12 h post infection by quantitative reverse transcription-polymerase chain reaction (RT-PCR). The production of viral RNA and viral particles peaks within 48—72 h and declines thereafter. Figure 2 Infection cycle of rhinoviruses. The scheme summarizes the rhinoviral infection cycle from the attachment of the capsid to the release of newly synthesized capsids. Shown are the internalization of the capsids via endocytosis, the transport to the endolysosmal compartment, transition of the RNA to the cytoplasm, synthesis of viral RNA within the smooth endoplasmic reticulum, maturation of the capsid proteins, and self-assembly. to cluster to membrane domains positive for clathrin, supporting the notion of an uptake mechanism depending on clathrin-coated vesicles. In line with this finding is the blockade of HRV2 uptake by overexpression of dynamin-K44, a transdominant negative isoform of dyna-min, which is required for pinching off clathrin-coated vesicles from the plasma membrane. Uptake of rhino-viruses via clathrin-coated vesicles is very fast and does not take longer than 30min. 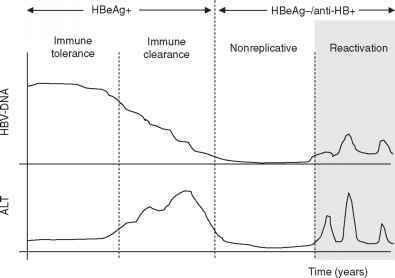 Moreover, preincubation with methyl-b-cyclodextrin (MBCD) interrupts the uptake of HRV2 at an early stage. Rhinoviral capsids pile up close to the plasma membrane and are not transported to the endolysosomal compartment in cells treated with MBCD. MBCD depletes cholesterol from cellular membranes and leads to destabilization of membrane domains which are thought to play a central role in signal transduction and endocytosis. Recent work indicates that another subgroup of membrane domains termed ceramide-enriched membrane platforms plays a crucial role in the infection cycle of rhinoviruses. These studies demonstrate that pharmacological or genetic inhibition of ceramide-enriched platforms reduces rhinoviral titers in epithelial cells. Membrane domains may not only be involved in the first steps of internalization, but also play a role in transport of vesicles and fusion of transport vesicles, endo-somes, and endolysosomal vesicles, finally triggering acidification of the vesicle which is required for uncoating of rhinoviruses and transition of the RNA to the cytoplasm (see below).